Why He’s Top 40: For continuing to promote and cultivate the city’s professional music scene, while teaching music to people recovering from drug addiction. When most people discover Don Berner is a career jazz musician, the first question they ask is if he can make a living at that. Not only does Berner make a living, but he’s made a career out of breaking the stereotypes of the typical jazz musician. “I don’t wear a fedora, I don’t wear zoot suits, and I don’t sleep in till noon,” says Berner. 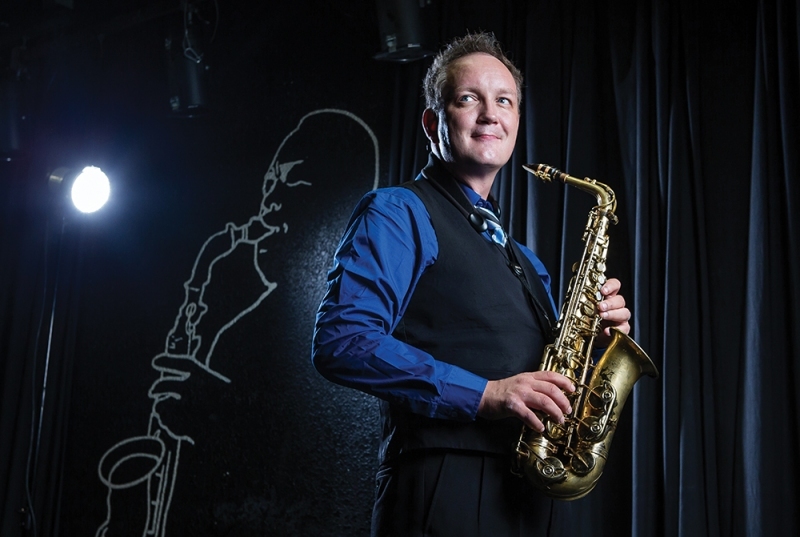 He’s a regular performer at the Edmonton Jazz Festival, served as its co-producer for two years, and has been a featured performer at the Montreal Jazz Festival. He’s also played alongside the Temptations, and performed at the Festival Internacional Cervantino in Mexico, to name only a few accomplishments. However, Berner’s influence is best felt at home. He’s served as host for CKUA‘s A Time for Jazz, and wrote a similarly themed column for the now-defunct SEE Magazine. Berner has also spent a lot of effort living up to one of his heroes: Tommy Banks, the pianist-turned-television-host-turned-senator who gave Berner one of his first big shows on the bandstand. Berner’s personal project, Horns for Hope, works with the Hope Mission drug recovery program. Participants of the program are paired with more than 50 local musicians to learn teamwork, accountability, and organizational skills by learning to play in a band. Berner’s experience with the project had a much deeper personal affect than expected. “I don’t know what kind of Mr. Holland’s Opus fantasy I had going on,” says Berner, “but dealing with that particular community, I had no idea how heartbreaking it would be. Not everyone wants to be fixed. It’s affected me greatly. It makes me a better person and more empathetic. And it really makes you not sweat the small stuff.” And he uses this attitude to approach not only his volunteer work, but the music business as a whole.